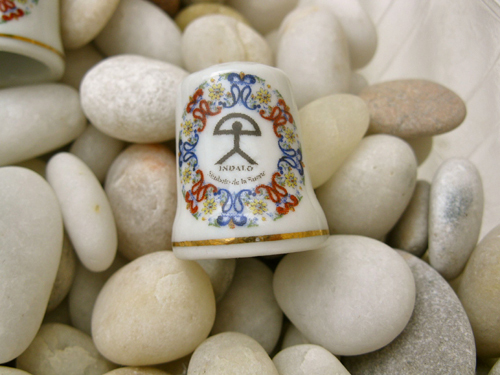 This unique china thimble features the magical good luck symbol of the Indalo and would make a truly special gift with meaning. The Indalo symbol is steeped in history and is said to have magical powers to offer protection from harm, and bring happiness and good fortune. Good luck charms make people feel good. This one could be an ideal little gift for a wedding anniversary, the arrival of a new baby, mothers day . . all sorts of occasions, or could be added to a collection of thimbles as something unique from Spain. Comes gift-wrapped, like all our presents (with an information card about the Indalo) - and we can add a personal message on your behalf.